Everything you do is an action of some kind. Action words are called verbs. In Spanish, verbs are much easier to recognize than in English. That's because all verbs end in -ar, -er or -ir. Here we're just going to talk about verbs that end in -ar. Lots of actions that you do every day end in -ar. Two common verbs that end in -ar are hablar and escuchar, which mean to talk and to listen. 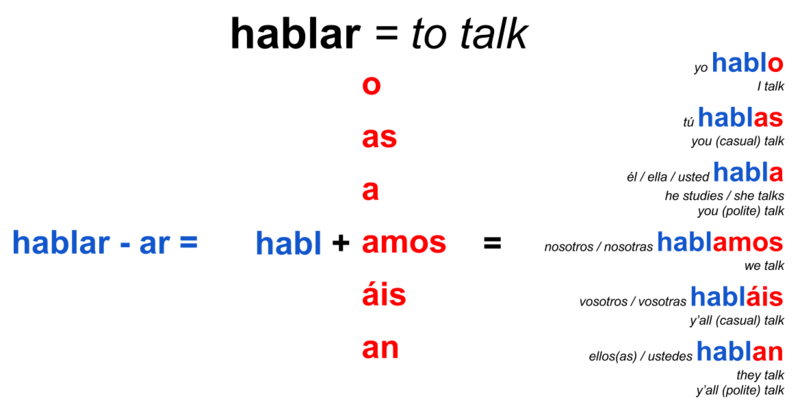 To use verbs in Spanish, you usually take off the -ar (or -er or -ir) ending, and replace it with a special ending to indicate who's doing the action. When you do this, you are conjugating the verb, which means matching the verb to the person. 1. Take off the -ar ending. 2. Add one of these 6 endings: o, as, a, amos, áis, an. Watch the video on conjugating -ar verbs. Take the quiz on conjugating -ar verbs.